Just as private businesses, public authorities and development organizations often need to keep track of numerous parallel and overlapping workflows and processes. Making sure that the right person takes the right decision at the right time is a major management responsibility and often the key to overall performance of an organization or project. Typical examples are procurement processes and grant schemes, which share a number of basic issues such as the need to follow strict operating procedures, to closely monitor milestones and timelines, and to check the fulfillment of contractual obligations. A flexible software application, which is adapted to the requirements of the international cooperation sector, can provide significant assistance in fulfilling these requirements. The solution must support the initial definition of requisitions in the procurement plan. 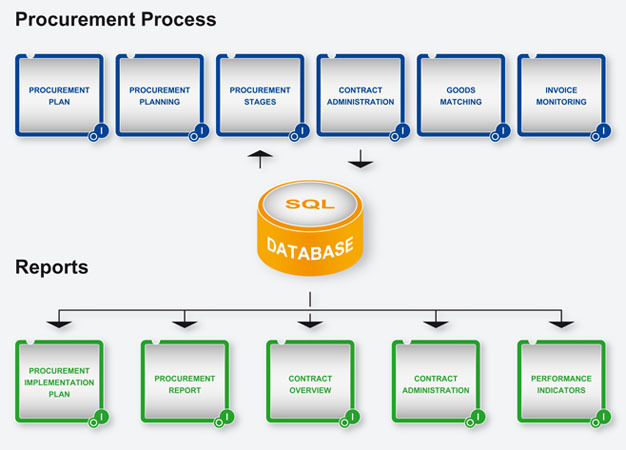 The requisition’s progress is then tracked through the requisition cycle, depending on the selected procurement method and allowing for the differing levels of authorization. Once a goods, works, consultancy services or non-consultant services contract is signed it must be administered by multiple users, the received goods must be accounted for, invoices reconciled and paid. In addition, the solution must support the attachment of documents, emails and images for each step in process. At the same time, users require a personalized up-to-date overview of their requisitions, contracts and tasks in an inquiry and analysis module. A set of complex, highly flexible, consolidated reports is also needed, such as the Procurement Implementation Plan or Contract Implementation Plan. Finally, a set of Key Performance Indicators are defined to track contractors’ performance as well as the performance of organizational units. GFA B.I.S. has developed a vertical software solution for Procurement Agents, contract and grant management based on INFOR SunSystems Procurement, a professional web-based software solution which helps maintaining accurate and complete records of relevant data and decisions. As an additional asset, the software allows for a flexible design of reports, which produce up-to-date information for managers and stakeholders. By customizing the software to the client’s specifications, GFA B.I.S. offers a valuable tool for the efficient administration of contractual relations with providers and partners.